I made this card for a couple of challenges. I used the Midnight Madness sketch24 and Flourishes Timeless Tuesday Challenge to use Watercoloring. I stamped my Flourishes image in VersaMark and heat embossed with Fine Detail Gold embossing powder by Ranger twice. I cut out the image twice so I could pop up some of the petals. The paper I used is that semi glossy cs I have used before that came from an office supply store. To see my description of this technique on this cs click here. I love using this glossy paper because there is a rich gloss to the finished design. (I am not sure whether a very glossy cs would work the same way or not.) I lightly wet the paper and then touched SU! Markers in appropriate places using Pretty in Pink and Blush Blossom to color the poinsettia. I did the same to the two die cut panels from my Spell Binder's Fleur de Lis center die. For my sketch, I used a base of Papertrey Dark Chocolate, then Old Olive and then the Designer Paper is SU! Holiday Treasures. I still love this paper and am so glad I hoarded a bit of it last year so I can use it now! LOL! I used my SB Label #6 to cut the green label and embossed it, then did the same with Brushed Gold from the Paper Co.. I added the small Fleur de Lis die cuts in the green behind the gold, added lots of pearls from ZVA (available soon from Our Daily Bread designs). The image is popped up on dimensionals on both layers. I love how this one came out! I hope you do too! As always, thanks for looking!!! Have a blessed week! My Goodness Grace, this is AWESOME! Everything about this beautiful creations is amazing. 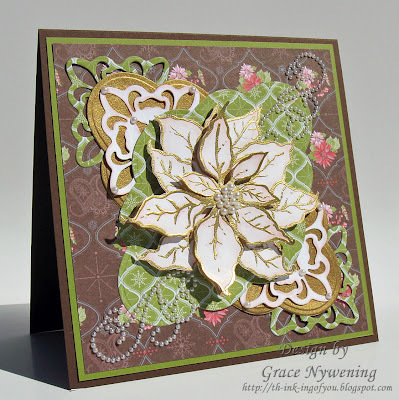 Love the diamond flourishes in the background and your lovely white poinsettia!! Those Spellbinders cutouts are wonderful. Just an elegant, elegant card!! The MMDesign Team thanks you for playing in our challenge this week and we most assuredly will be looking for you next week too! Wow Grace this and the snowman one are both over the top gorgeous!!! I love them all. Wow-za! Grace, this is gorgeous! So many fablous details! Wow! Oh...my..can't...breathe...so GORGEOUS!! I'm envious of your swirl pearls!! Wow this is such a gorgeous card. I love the swirls of pearls as well as your embossed poinsettias! Such a lovely job blending everything together! Thanks so much for joining us this week at MMSC! I so enjoyed viewing your artwork! Grace this is extravagantly beautiful beyond compare. How captivating all those luscious pearls are. This is a work of art made to be seen and appreciated for many years to come. Thanks for playing along with us at MMSC this week. I love your amazing work and enjoying each thing you create. Oh My, how we forget that Poinsettias are white too not just red. Very nicely done and great thinking having it be white. Love all the colors in the card, the pearl center, and the pearl swirls. Thanks for joining us at Midnight Madness, your cards are such a treat. Oh Grace this is outstanding to say the least! I am speechless!!! WOWZER - Grace!!! This is one gorgeous card!!! Love every inch of it!!! Super card Grace..WOWzers.. All of this and company too. The layers really look terrific.. Gives the card a great depth.. I like the poinsettia and the colors you chose.. Super job..
Grace another jaw dropper! Wowzers! This is a beauty! Wow, this is just gorgeous, what an awesome take on the sketch!! This is absolutely stunning Grace!!! I love your poinsettia and all of the pearl flourishes. So elegant and beautiful!! Love it from top to bottom! Hi Grace! WOW! This just POPs off the page! Just gorgeous!! Thanks for joining us again this weeks. It's always a treat to come visit your blog! Very Stunning!! !This is one beautiful card. The texture makes this card just pop. Wonderfully done! WOW and WOW again!!! Your designs are always so beautiful Grace...but this one...stunning! Really stunning! I love all the layers and textures on this card and the pearls too! I'm in awe right now! Thanks so much for blessing us each week with your creations. An absolutely stunning card, so much detail. Congrats on receiving MM remarkables recognition, well deserved. What a glorious and wonderful card this is!! I'm so glad to have visited your blog and leave this comment and get to hear my man, Chris Tomlin singing "Glory in the highest" as I write. Your blog just always is such a blessing to visit.